← Sing, Dance, Eat, Celebrate and Give! 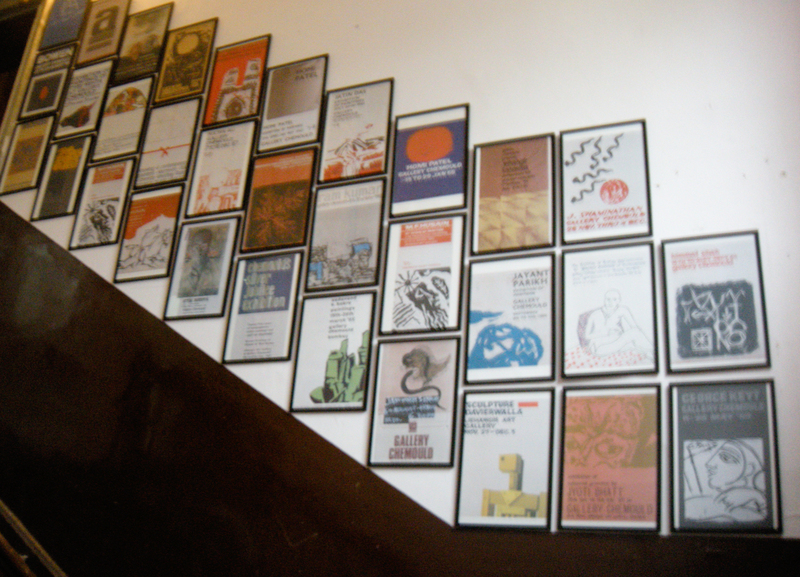 Wall along the stairway leading to Chemould Prescott Gallery is plastered with framed posters of earlier exhibits. Chemould Prescott Road, a contemporary art gallery is located on the third floor of the same building. The gallery is approximately a 5000 sq.ft space – a very inviting and open space with huge ceilings and a smaller space separated by a partition for more intimate art work. The gallery recently featured the work of artist Paula Sengupta; the show titled ‘Rivers of Blood,’ chronicles the artists memory of her families displacement from East Bengal to West Bengal in 1947. In 2008 Sengupta revisited her ancestral homes and this show documents her travels through Bangladesh. The show is a visual rendering of her diary. 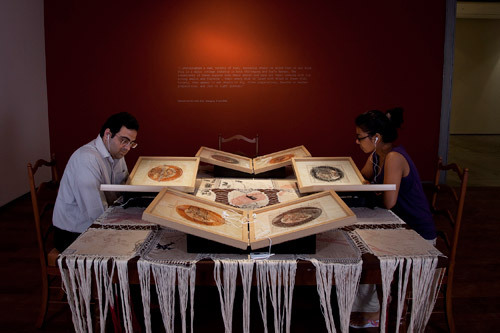 To narrate her diary Sengupta has used the technique of Nakshi Kantha(a quilting tradition from Bangladesh). By embroidering on found colonial textiles from the region Sengupta reminds us of the social, cultural and political scenes of the time and continuing traditions. Cox's Bazaar the English east-west fish bar, Kolkata Dhaka I - IV, Image courtesy of gallery website. One work that I instantly warmed up to was ‘Cox’s Bazaar the English east-west fish bar, Kolkata Dhaka I – IV.’ The display consisted of a dining table setting with embroidered linen table-cloth, with four framed printworks with images of fishes embroidered. Each framed print also had a headphone attached with a narrator reading excerpts from the artist’s diary. The embroidery, the imagery and the excerpts instantly transport you to West Bengal and the viewer traverses the same paths experienced by the artist herself in her journey of discovering her cultural heritage and tradition. The strategic placement of this work at the very beginning of the show and an intimate dinning table setting was very inviting and a good beginning to a culturally rich meal. An invitation that I would never turn down. Images of the gallery and work can be viewed on the gallery’s website. I will be looking forward to the next show titled ‘Cities of the Future,’ by Shezad Dawood. This entry was posted in Art, Culture, Design and tagged art, Bangladesh, Bombay, Culture, Embroidery, gallery, Mumbai, Traditions. Bookmark the permalink.